We're all busy parents, which is why it's important to do something for ourselves sometimes. 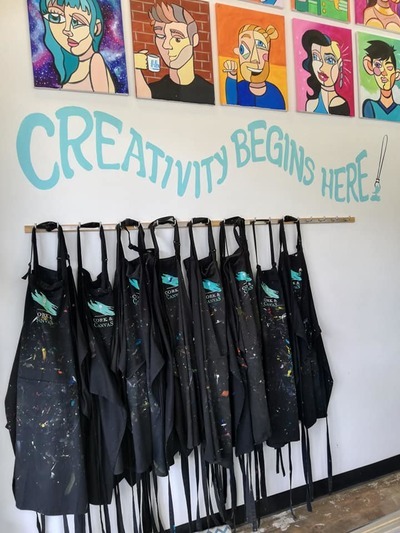 If you're a creative type, or even if you're not but you're looking to participate in something completely different and super fun, consider a Cork and Canvas Paint and Sip Session. Cork and Canvas is Australia's first Paint and Sip Studio. 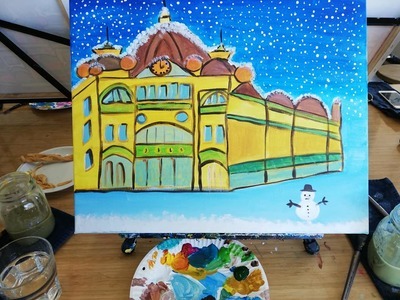 Two and three-hour painting classes are held in a welcoming art workshop in South Melbourne. Sessions are held on set weekday nights and most weekends. 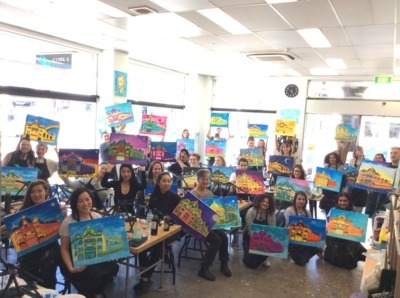 Let the wonderful Cork and Canvas staff lead the way so that you can paint, drink and chat over the course of the session and go home with your very own piece of art. 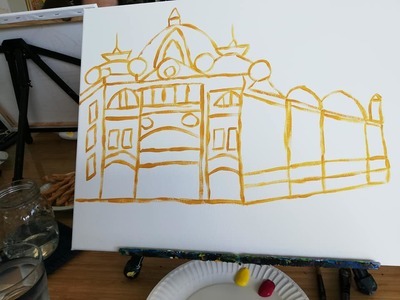 Having participated in a three-hour Cork and Canvas "Flinders Street Station" painting session recently, I can honestly say it's the best thing I've done for myself in a really long time. The staff at Cork and Canvas are lovely. Admittedly my friend and I had a couple of reservations; what if our paintings were not up to scratch? Would we go home with a laughable piece of art? We needn't have worried. Cork and Canvas sessions are not serious art classes at all. They offer newbie artists the chance to unwind, have fun and enjoy the process of painting in a relaxed environment. It really didn't matter whether our take-home paintings were rubbish, OK or masterpieces! Each step of the way, the friendly Cork and Canvas crew were on-hand to answer questions and guide through mistakes. I must say, it helped having the canvases sketched out and ready for us on arrival because this gave us a base to begin our painting. I thought three-hours would be a long time to paint, but the time flew. When we reached the last 15 minute countdown my friend and I couldn't believe we were close to the end of the class. That to me, is a sign of a good time! As well as the participation, I partiucarly enjoyed seeing my fellow painters' variations of our set theme. I'm confident Flinders Street station has never looked so colourful or vibrant! Cork and Canvas sessions allow you to tap into your creative side and show off your personality in a fun organised session where nothing is taken too seriously and plenty of fun is had. Sessions are not limited to Flinders Street. Choose from a Banksy inspired piece, Picasso, Mt Fiji, Brighton Beach Boxes and so much more. 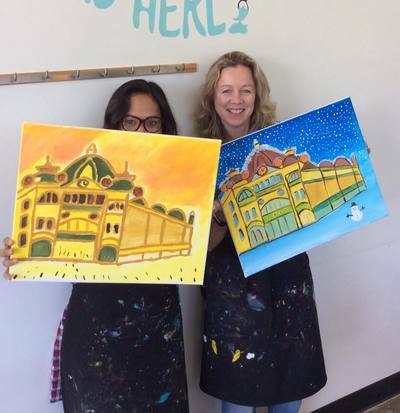 Painting sessions start from $50 for a two-hour session and $60 for a three-hour. Children 9yrs plus are also welcome to join in should they wish. Other options include private classes otherwise the Cork and Canvas crew can come to your venue. If you're looking for a gift idea for Christmas, birthdays or any other occasion, consider a Cork and Canvas voucher available here.